BirdCam Solar Power Panel. Not Batteries Necessary! With the PowerPanel you never have to worry about missing a shot because of dead batteries. The PowerPanel uses innovative software to combine a solar panel and built-in 12-volt battery, extending camera life indefinitely in the field. 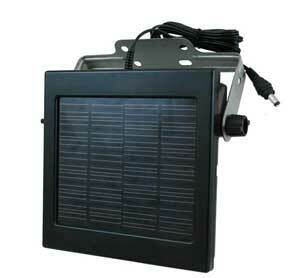 Product Features: solar panel with built in 12-volt battery. LCD screen displays; easily mount to tree or pole. 10 foot cord allows placement in optimal sunlight; weather resistant.